I'm throwing this out to any gurus out there :) I am curious if there is a way to chage the default "src" in the "Create source root" entry of the "New Project" dialog (see attachment)? 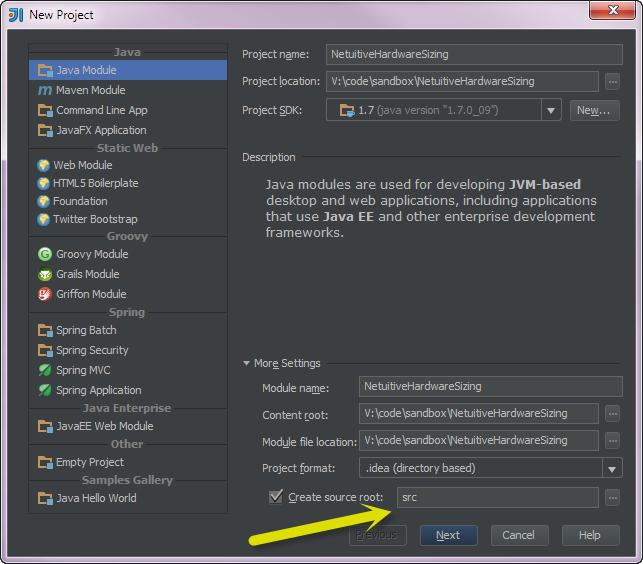 I usually update it manually to "src/main/java" ans would like to set that as the default. I looked through the ~/.IntelliJIdeaXX/config/ & ./system/ folders in hopes of finding a new project default config or similar. I will create several projects a day as I do small what if's / PoCs / and code snippets for people. Obviously doing this manually isn't much hassle at all, so I am throwing the question out there. Thanks Denis! I have opened feature request: IDEA-106148. Thanks, assigned the ticket to myself so far.